You’re on Happy Birthday Wishes, Page 2 of 10 Birthday Wishes and Quotes. Birthdays are always special. They are fun and full of colors, smiles, sweets, and great food. They are also the time for letting others know that you’re thinking of them with some happy birthday greetings. Friends and family are the biggest gifts in your life, and you don’t want to be too conservative when it comes to showering them with good wishes on their birthdays. You want them to be their happiest and feel blessed. What better way exists to achieve this than wishing them a great birthday in creative ways? There are no restrictions to how you wish or what you say to your friends. Have some fun with it. Be creative! Thank you for adding another year to your life and for giving a full year’s supply of fresh carbon dioxide for the trees! Have a great one! It saddens me to see you marching ahead so gracefully to your inevitable demise! Just kidding – Have the happiest of birthdays! I don’t know what I have been told, but someone here is getting older today. Scientists have proven that those who celebrate more birthdays live longer! Have a cool birthday! Remember you used to live inside a human? Good thing you are not doing it anymore! After we ordered your birthday cake, we called the fire department to blow out the candles. Another year gone and you are older. But that doesn’t mean you have become wiser in any way! I wished only some of your dreams to come true this year so that something is left for me to wish next year! Keep smiling while you still have teeth! If someone calls you old, hit them with the stick and throw your teeth at them! Have a marvelous Birthday! You can never find a better friend than your siblings. They have been and will be always there for you! You have always been lovely, sweet, and a little annoying! Have a sweet birthday sister! I promise I will stop telling everyone about your childhood mischief and pranks from this day, just like I promised on your last birthday! Have a special day Sis! When the cake costs you less than the candles, it is time to realize you are getting old! Hope you have a wonderful day! You are mom’s second favorite child! Guess who’s number one! Have a great day! I hate being fat, but I love eating cakes! Where’s your birthday cake? Hoping your day is as wonderful as you are! I don’t know what’s wrong with your birthday, but as always I am certain that it’s your fault! Have a magnificent day! 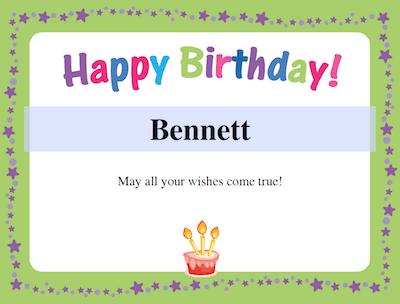 Six Happy Birthday Certificates templates – Check them out by clicking on the image above. How can you bring a smile on your hubby’s face and in their heart? Please pour out words of love, but don’t forget a touch of sarcasm! A strong husband can put up with some teasing. I didn’t know how many candles to put on the cake because I have forgotten how many times you turned 39! You know what’s great about your birthday? Every year I keep looking better standing next to you! Have a wonderful day sweetheart! I love growing older along with you. You mean so much to me! You are aging like a wine, but I am about to give up on drinking! This is your special day. Good times became better and bad times became easier when shared with you! Have a terrific day! You are one person for whom I can ignore all the sorrows and pains of life! Enjoy your day! Sun may be the center of the solar system, but you are the center of my universe! Have a sensational birthday dear! Your parents are so lucky to have such a great son! I thank them for bringing you into this world! You’re the best sweetheart! Best wishes to the man who never does anything wrong on his birthday! Don’t ask about the remaining 364 days of the year! Wishing you a great birthday! Tip: These happy birthday wishes make excellent captions on Instagram and Facebook. Your daughter always look to you for inspiration. Show them your best side when it comes to wishing them a great birthday! The sun is shining brighter today to wish you a very special birthday! Today nothing else matters more than your happiness! Happy birthday to my angel! What is the similarity between you and a birthday cake? Both are so sweet! Happy birthday my baby! Time to blow candles and open your gifts! You’ve come a long way, baby! Happy friends and good times for you on this special day! You are beautiful like the flowers and precious like the diamonds – the brightest star for us! How you bring happiness and joy into our lives! Wishing you a wonderful day and year! You are one more year older today, but that’s still not enough to stop going to school! No homework for you today. Only gifts, balloons, games, and a big cake! No one can take your mom’s place and no words can be enough when it comes to praising and wishing her! Give a shout out with these happy birthday messages for mother. You are like a diamond as you shine brighter every year. To the greatest Mom – enjoy your day! Superheroes are one in a million and a mother like you comes only once in a lifetime. The greatest Mom deserves a great day! You have the biggest heart in the world! Thanks for keeping me in it! You are the world’s best mother and you should have a birthday that’s as amazing as you are! Wow, look at all the candles! Not even the biggest lottery winner is luckier than me! I am the luckiest to have you as my mom! Happy birthday! Tip: These Happy Birthday Wishes make great captions for photos of the birthday boy or girl with cake, family, etc. They say that most people never realize how important their father is until he’s gone! Mother’s are the greatest, but remember your father is the man who won the heart of the greatest! Imagine how great he is! As you get older, you look funnier. To the greatest Dad, have a great one! I know today is your birthday but I would have loved it if it were a holiday too! Just kidding! It’s your day – enjoy! Congrats on the 30th anniversary of your 18th birthday! You never age! Happy birthday to the greatest dad in the world! I wish for all the smiles for you, as long as you still have your teeth! Dad, it’s your day to shine! You are a 20 year old young man with 30 years of experience! You’re my inspiration – have a remarkable day! You are the biggest celebrity for me, and I am your biggest fan! Pops, enjoy your day! Have a special day my amazing, hilarious and wonderful friend. Glad you’re part of my wolf pack! Have a howling good time on your birthday! Birthday calories don’t count – eat that cake my friend. A birthday hug and squish for you! Never stop being you – you’re wonderful! Wishing you every happiness your heart can hold. Age is merely the number of years the universe has been enjoying your presence! If you have any suggestions for Happy Birthday Wishes, please let us know on the Contact page. Thanks! How blessed I am to call you my friend. Never change hombre and have a great day! My friend, I’m so glad you came into my life. Happy B-Day! To the beginning of the best year ever! As you celebrate another year of life, always remember how much happiness you bring to my life. A special friend and a special day – Enjoy every minute of it! You’re on Happy Birthday Wishes page. Check out our list of Friendship Quotes.